Netizen Report: Gambia to Ban Internet Activism? 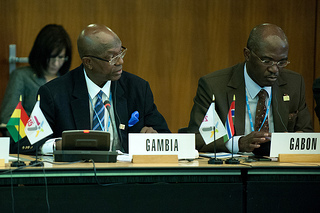 Gambian Information and Communication Infrastructure Minister Nana Grey-Johnson at WSIS+10. Photo by itupictures (CC BY 2.0). Most of this report was researched, written, and edited by Lisa Ferguson, Hae-in Lim, Yuqi Chen, Alex Laverty, Renata Avila, Ellery Roberts Biddle, and Sarah Myers. Global Voices Advocacy's Netizen Report offers an international snapshot of challenges, victories, and emerging trends in Internet rights around the world. This week we begin in Gambia, where lawmakers have passed sweeping legislation that targets political opposition online. In the Philippines, Congress is set to review the Magna Carta for Philippine Internet Freedom, a comprehensive bill of law that addresses key areas of human rights online, including free expression, privacy, intellectual property and rights to Internet access. A brief analysis of the law by the Electronic Frontier Foundation can be found here. Russia passed a new copyright law that will establish a single “copyright court” for the country, where content holders may request the blocking of sites featuring content that infringes copyright restrictions, as well as hyperlinks leading to these sites. This will lead to the creation of yet another Internet blacklist in Russia. Wikimedia Russia Executive Director Stanislav Kozlovsky said that this will likely lead to the blocking of Wikipedia in Russia, as the site contains an ever-growing number of hyperlinks to sources that may be blocked under the new policy. The EU parliament has adopted a cyber security directive that would mandate a new maximum prison term of three years for those attempting to illegally access information systems and five years for those who launch cyber attacks against infrastructure or government networks. The policy also increases penalties for illegally intercepting communications, or producing and selling tools to do this. The Directive has yet to be approved by the EU Council. Myanmar and Sri Lanka have banned the sale of Time magazine for an article highlighting sectarian tensions between Muslims and Buddhists in their respective countries. The online version of Time, however, remains accessible. The ban was triggered by a July 1 story on a prominent Buddhist monk in Myanmar that bore the headline, “The Face of Buddhist Terror.” Myanmar's government had banned the article “to prevent the recurrence of racial and religious riots.” Myanmar President Thein Sein on Tuesday urged the media to “responsibly” exercise freedom of expression. Russia’s most famous dissident blogger Alexei Navalny could face six years of jail time for allegedly swindling 16 million rubles from a timber company. Navalny has been leading a prominent online crusade against state corruption since 2007 and Navalny stands by his innocence, claiming that President Vladimir Putin is using the judiciary to stem exposés of government corruption as well as to curb Navalny’s growing popularity, especially among Russia’s middle class and urban youth. Germany's Der Spiegel reported that US President Barack Obama has agreed to discuss US spying activities in the EU with Germany. The European Commission announced that a joint US-EU group will investigate the alleged spying and will report its findings in October. These announcements come ahead of talks between the EU and US which could create the world’s largest free trade zone. French newspaper Le Monde reported that France has a vast data surveillance program that intercepts and stores computer and telephone metadata of millions of French citizens. Twitter has launched a new Arabic translation service for some of the most-followed accounts in Egypt, in an effort to make it easier for non-Arabic speakers to follow news and opinion in the country. Among the 63 popular accounts being translated are those of ousted President Mohamed Morsi, opposition leader Mohamed ElBaradei, and activist Wael Ghonim. The Asia Internet Coalition, a group set up by Internet giants Google, Yahoo!, and Facebook, and Ebay, wrote to Singapore’s Minister of Communication and Information expressing concern over new regulations that require news websites to obtain state licenses and to pay a bond of S$50,000, money that is put towards enforcing the government’s 24-hour take down notice policy. MIT Media Lab is working to measure emotions people can experience in response to their metadata. MIT Professor César Hidalgo has launched a new project dubbed “Immersion,” which allows people to visualize and more viscerally experience their metadata in ways Hidalgo compares to an “out-of-body experience”. Gizmodo has posted a map of the Internet from 1977, showing the main hubs (including Stanford University and the Pentagon) with the computer that was hooked up to the network at each access point. The maps were drawn often and collected by the ARPANET Completion Report, which deemed the project a success.